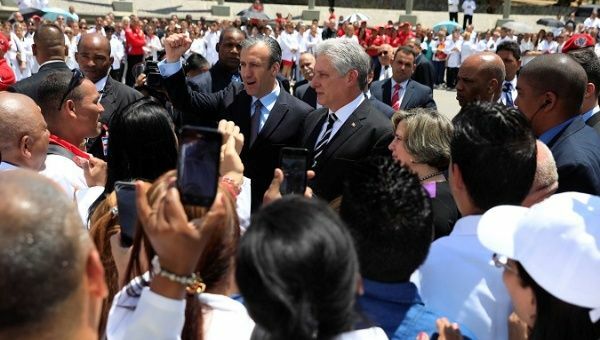 “Venezuela now needs our solidarity,” Cuba’s President Miguel Diaz-Canel said. May 30 (teleSUR) Cuba’s President Miguel Diaz-Canel flew into in Caracas Wednesday for his first foreign visit as head of state, a show of solidarity for Venezuela President Nicolas Maduro who was reelected for another six-year term in office earlier this month. He added that on Sunday, May 20 when presidntial elections took place, “I, like many Cuban families, dedicated the day to follow what was happening in Venezuela,” he said, adding that the allaince between Venezuela and Cuba could give strength to the people who are victims of imperial aggressions. While the United States and European Union and other right-wing governments in the region refused to recognize the Venezuelan elections, progressive governments in thje country as well as China and Russia recognized the elections and have warned against meddling in the socialist-run nation, and fellow leftist governments in the region from Cuba to Bolivia have offered warm support. “Your words express the best of the Cuban people, and we are forever grateful for the support you have given us,” said Delcy Rodriguez, a heads the assembly said of Diaz-Canel. Maduro was the first foreign leader to meet with Diaz-Canel last month after he succeeded Raul Castro to become president of the country. Venezuela, which holds the world’s largest oil reserves, exchanges crude for Cuban medical and other technical services. Diaz-Canel flew to Venezuela with his wife Liz Cuesta as first lady. He was later expected to meet with Maduro at the Miraflores presidential palace.